Time just seems to be going too quickly. I cannot believe we’re already in November! There’s Halloween candy sitting in my dining room from trick or treat and Christmas commercials (and movies) already on television! My head is totally spinning. 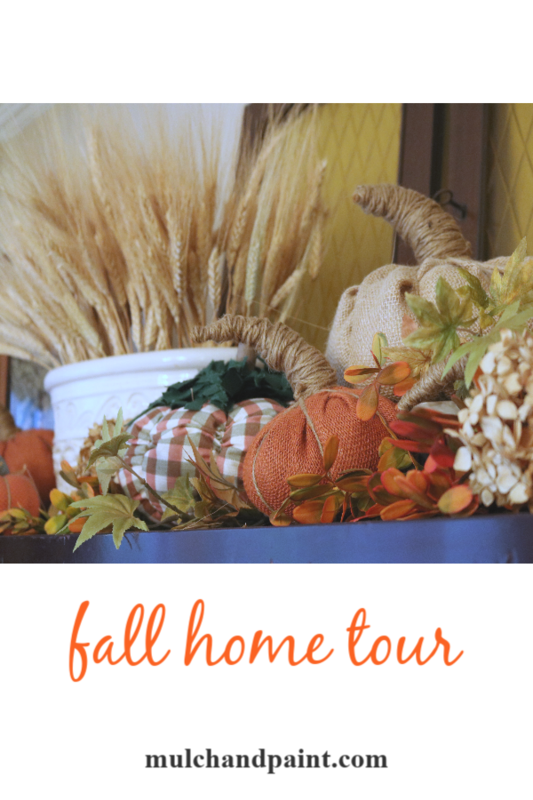 I am sharing with you today my Fall Home Tour. It’s really not a home tour but just a glimpse of what I’ve been doing around the house. 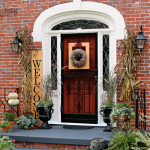 Let’s start at the front door. This year, I tried to keep my color scheme to red, orange and cream. I took the kids to a wonderful produce store we have in the area and we each chose our own special pumpkin. Mary picked the large cream colored pumpkin that naturally sits on it’s side. Trevor found this great orange pumpkin with wart-like growths all over it. I chose a large orange pumpkin that has splashes of green and looks like tie-dye. 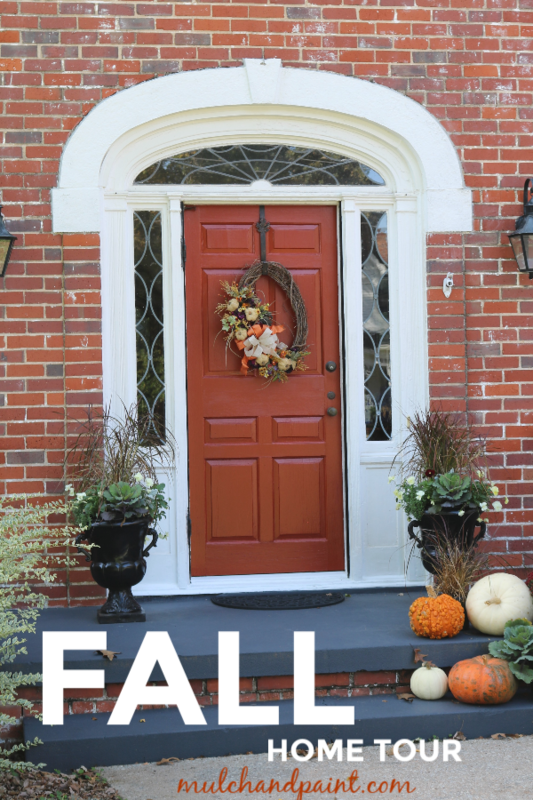 Did you see my front porch last Fall? If not, click HERE. My front door wreath is the product of a late-night struggle to put something together at the last minute. I pulled the oval grapevine wreath out of the basement and used a floral arrangement I had purchased at a yard sale for flowers. The ribbon is new and came from Hobby Lobby. The super cool pumpkins came in a 3-pack from a local floral wholesaler. In the Living Room, I went simple and used cream and gold. 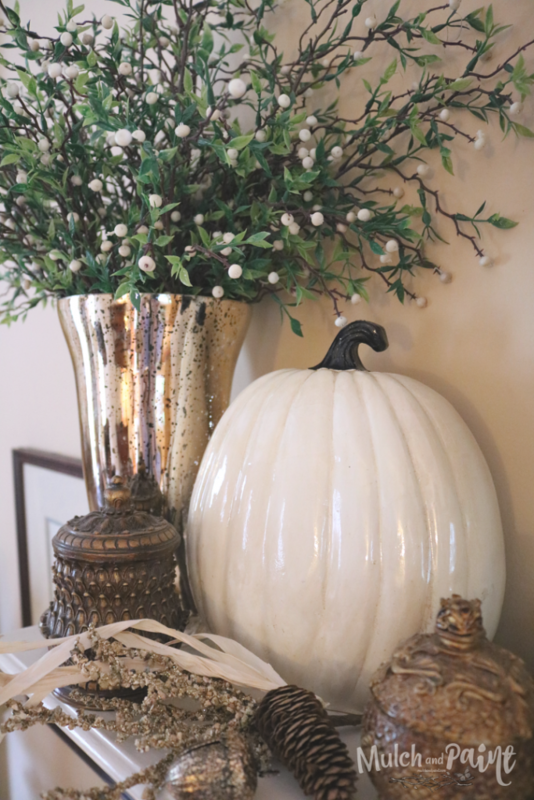 A cream pumpkin sits on one side of the mantle (from Kirkland’s…if you turn it around it has a Halloween saying printed on it) with a large vase filled with a white berries. 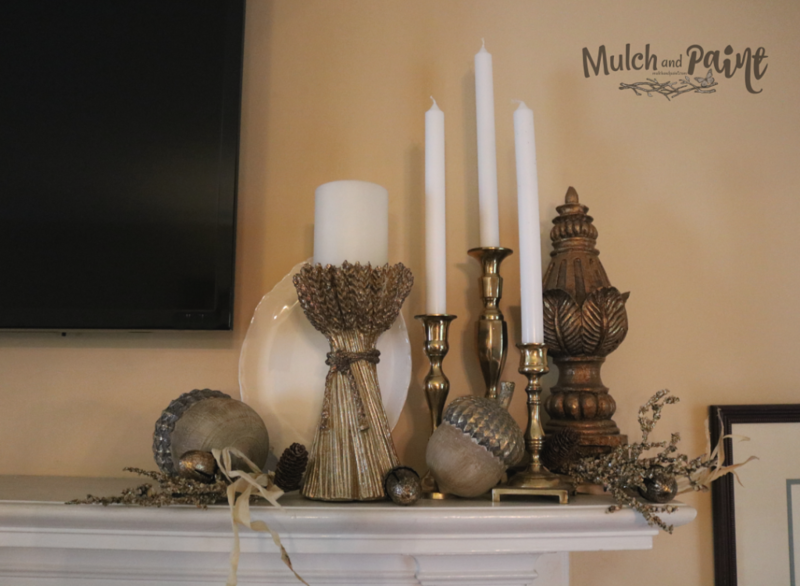 The small gold acorns are from Hobby Lobby. My television hangs above my mantle so decor is limited because of the small amount of space. The photo below is the other side of the mantle. 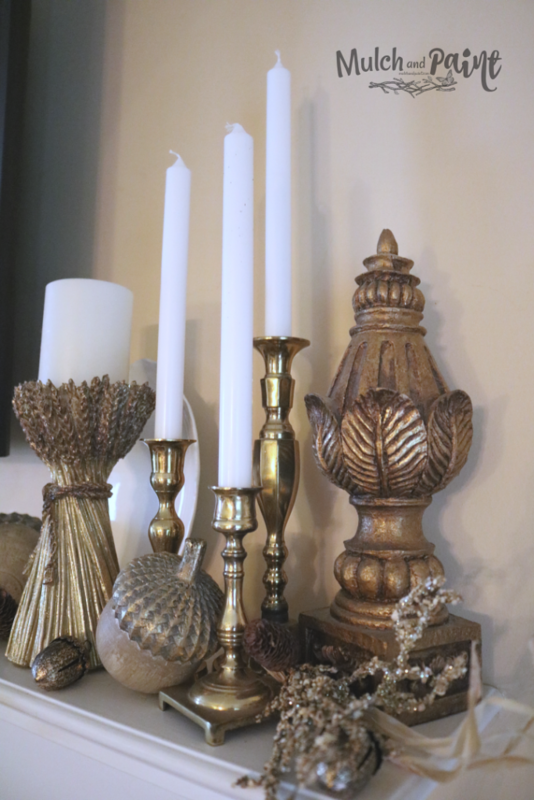 A few candles sit alongside more golden accents. I love the oversized gold acorns I bought at Kirkland’s. I just noticed that the large pillar candle is crooked. My apologies…. Welcome to my world. I wanted to share my little owl with you. 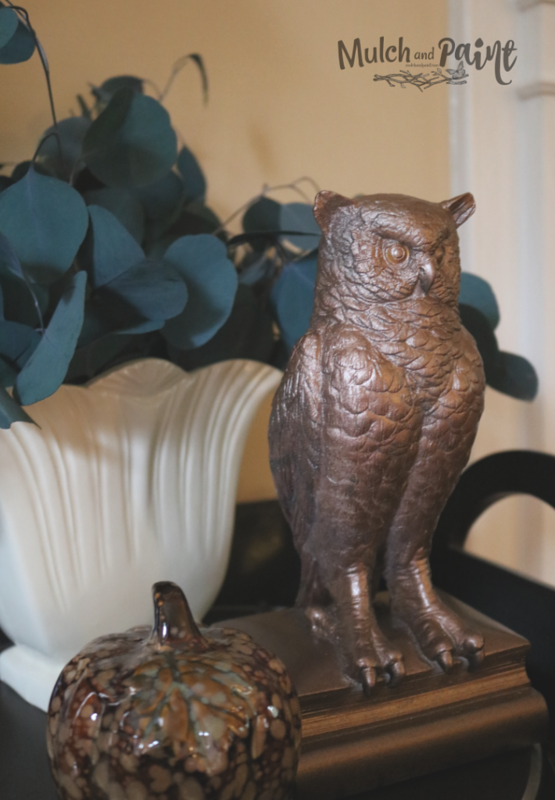 I found a pair of owls at a local thrift store a few weeks ago. The colors were awful but the owls had potential. I spray painted one of them this lovely bronze color. I love the way he turned out. Above is a photo of the top of the large china cabinet in my Dining Room. 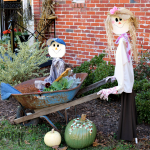 Many years ago, I made a ton of these simple burlap pumpkins with twine stems. 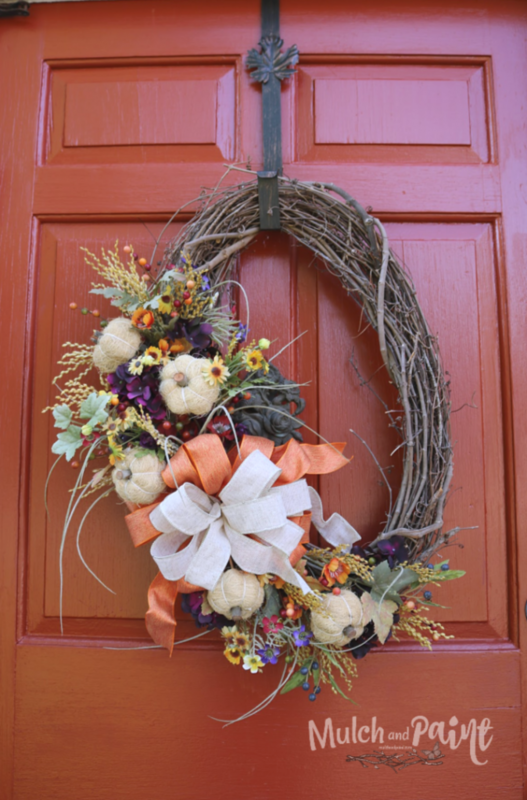 I mixed the burlap pumpkins with other fabric pumpkins and threw in multi-colored fall leaves and dried hydrangeas. A large ceramic vase holds dried wheat in the background. 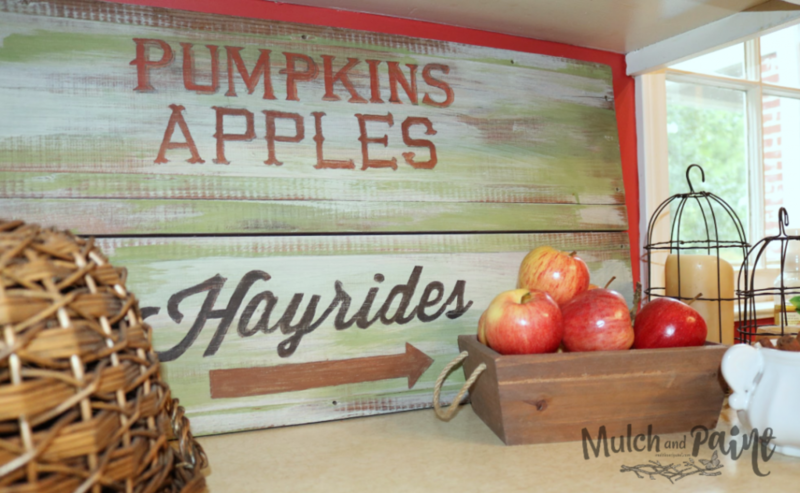 I wanted to snap a photo of the sign I have on my kitchen counter that reads “Pumpkins, Apples, Hayrides”. It’s not perfect, but it holds a special place in my heart. This is the first craft I did after seeing a tutorial on a blog. 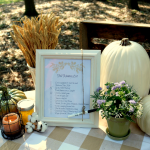 I found this great blog years ago called EllaClaire. Kristen Whitby has been such an inspiration to me throughout the years and I give a lot of the credit for me writing this blog to her. 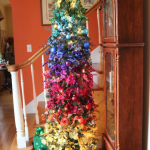 Her artistic flair and the way she decorates her home is so beautiful and she has such a great talent for photography. Check out her blog and I’m sure you’ll agree. 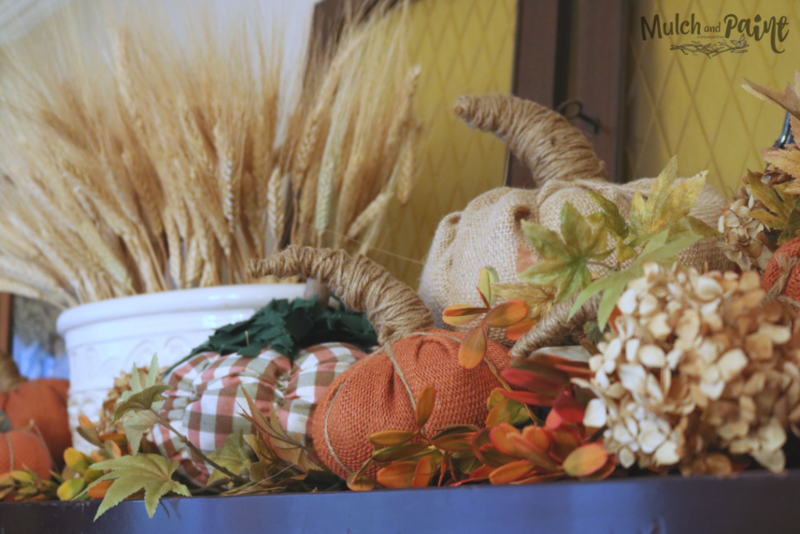 Here’s my Fall tiered tray. I filled the bottom level with small pumpkins, greenery and rolled paper flowers that I found at JoAnn’s. I have already confessed my infatuation with hydrangeas and dried hydrangeas. Because I have such an abundance of them, I placed some on the middle level of the tiered tray. 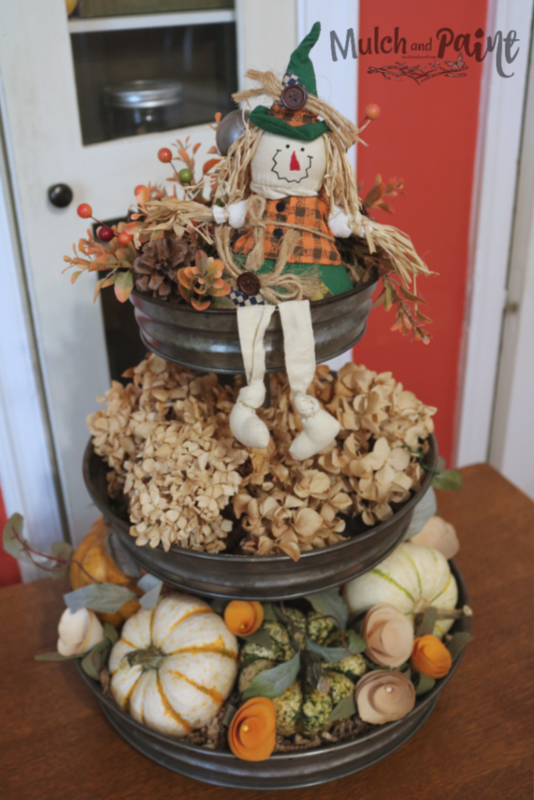 For the top, I mixed Fall colored leaves, berries and pine cones. A cute little scarecrow sits on top. 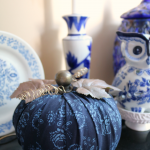 I wanted to also mention my foyer area that I chose to decorate for Fall in blue and white. I shared this with you a few weeks ago. 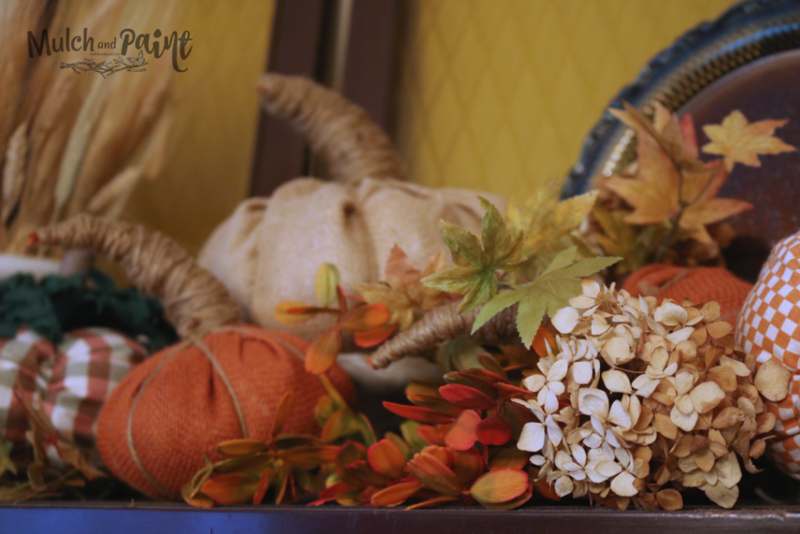 I like traditional Fall colors and think I will always use orange pumpkins somewhere but I did try to mix in other styles around the house. 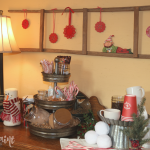 There’s no formula to how I decorate (no surprise there) but I just use what I like and what I have available. 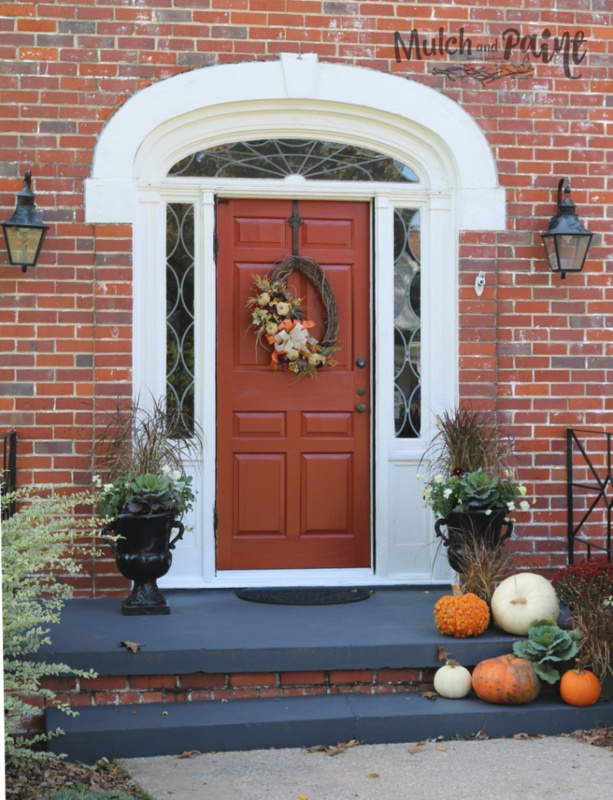 Do you like the traditional colors of Fall or do like to change it up? Either way you roll, make it your own and do what you like. Take inspiration from others but make your home a space that you like being in. Thank you for stopping by today at Mulch and Paint! I hope you have a blessed day and take time to remember all of the things you’re thankful for.